Originally appearing at chicagotribune.com on Monday, Jan. 26, 2015. 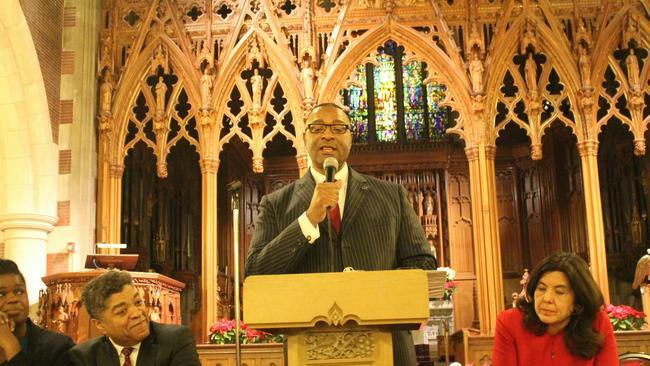 Cook County Commissioner Richard R. Boykin stood before an audience eager to talk to panel of clout-heavy officials at Grace Episcopal Church in mid-January. Rev. Shawn Schreiner opened the Jan. 15 town hall with a prayer stressing unity among the community to act in the spirit of Martin Luther King, Jr. towards reform. Boykin, who sits on the county’s criminal justice committee, co-hosted the town hall with 7th District Congressman Danny K. Davis. The event was conceived in the wake of ongoing protests over police-related deaths of Michael Brown, Eric Garner and John Crawford III. It included panelists like Cook County Chief Judge Timothy Evans, Cook County Board President Toni Preckwinkle, Cook County State’s Attorney Anita Alvarez, Oak Park Police Chief Rick Tanksley and Chicago Police Department 1st Superintendent Al Wysinger, among others. In 2013, the Chicago Police Department conducted 100,676 traffic stops, according to an Illinois traffic stop study by the police department. The American Civil Liberties Union of Illinois analyzed the underlying IDOT data regarding these stops and released a report on the ongoing racial disparities in encounters between police and members of the general public in the state. “For years, decades and almost a century now, law enforcement has been operating under the mantra of attempting to arrest our way out of the problems we face,” said Wysinger. But Wysinger said the department has realized in recent years that attacking core problems like the poor education system and poor community support systems in low-income minority neighborhoods is a better way to address the root causes of crime in the city. One such change was a change to two Chicago police task forces, totaling to about 500 officers, that had no “geographic accountability” and were deployed wherever they were needed, like the city’s troubled Englewood neighborhood. Wysinger said due to the nature of their deployment, they had no community relationships with the areas they were operating within, which made residents feel like strangers were coming into their community. So the two task forces were moved under the command of area police districts. That gave the community a chance to get to know the officers serving them and for the officers to develop a sense of responsibility for the areas they’re patrolling, Wysinger said. “If you don’t have any ties to the community and you just happen fly into the night when crime is rampant and do what you have to do and you get out, then you don’t really have any onus for what’s going on in that community,” said Wysinger. Jumping off that point, Tanksley said the core foundation for any healthy relationship between police and the public they serve is trust. Tanksley said police can’t take the public’s trust for granted, because all it takes is one officer’s mistake to make the public question an entire department’s trustworthiness. When it comes to people who have already been arrested, Cook County State’s Attorney Alvarez said her office has worked to expand alternative programs focused on veterans and those with mental health and substance abuse issues. The county’s Deferred Prosecution Program and Drug Abuse Program (SADAP), also known as “drug school,” is aimed at allowing someone who was arrested for a non-violent felony or misdemeanor to avoid a conviction. The goal is to give younger first-time offenders a second chance, she said. As for incarceration, Boykin said the county spends $600 a day per child held in its Juvenile Detention Center at the corner of Roosevelt and Ogden and spends roughly $143 per person held in Cook County Jail at 26th and California. “For too many decades, we politicians have been so concerned with being tough on crime that we forgot to be smart,” said Sen. Don Harmon (D-Oak Park). Regarding drug cases, Harmon said the law allows Cook County to hold someone in the jail for up to 30 days without even hearing to see if there’s probable cause to hold them. About 12,000 people had their hearing dismissed but they spent an average of 25 days in jail before that, he said. Abishi C. Cunningham, Jr., director of the Cook County’s Public Defender’s Office, said officials need to be smarter about where they’re spending their money if they want to reduce crime and reform the criminal justice system.